con•fet•ti – Because life is more fun when it's festive. 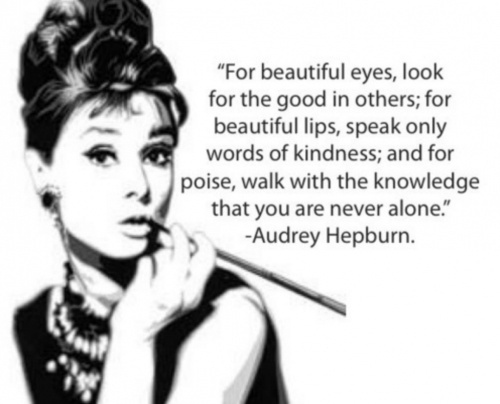 On the day that would have been Audrey Hepburn’s 85th birthday, I had to share one of my favorite quotes from the actress. Great food for thought as we start another week. Handmade Mother’s Day gifts are almost always more special than anything you can buy at a store. I love this roundup up 20 creative ideas for DIY gifts. And to further reduce cost, you can print gorgeous floral gift wrap with this free template. If you’re in a pinch for time, Red Envelope offers unique Mother’s Day gift ideas here. Their categories of Modern Mom, New Mom and Grandmother make it easy to narrow your search. Add a twist to your Cinco de Mayo meal by making these Margarita cupcakes. Lime cake with lime tequila buttercream . . . wow! If you buy an old dresser from the flea market or Craigslist, you can take it from blah to beautiful with these 10 DIY ideas. Sangria is one of my go to cocktails for summer entertaining so I can’t wait to try this recipe for Grapefruit Sangria. Kate Spade has collaborated with Keds to update two of their classic styles with floral and geometric prints. You can see the collection here.